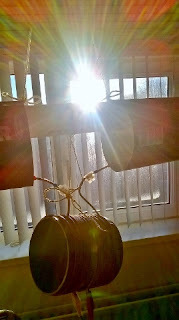 The 15" cylinder dipole amazes me time and time again. 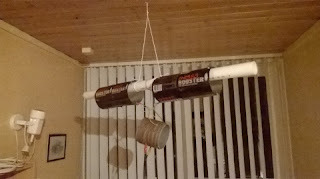 Today I was surprised by the cylinder dipole that is made of two Monster energy cans and a coil that hangs inside the shack, on the first floor. 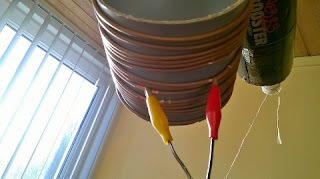 This antenna with a length of 15 inches, has proven before, that it is doing fine on 21 MHz. After a number of QSOs's with Russia and the Ukrain, I made a QSO deep in to Russia. An hour before the end of the UBA DX contest, I met Alexander R0AA from Atsjinsk. (Ачинск) My paper notes states that the QSO was easy. (makkelijk). This was QSO number 16 in the contest. Later I realized that R0 must be deep in to Russia. On the map I saw that Atsjinsk lays east of Kazakhstan and north of Mongolia. hi. The distance is 5223 km or 3245 Miles. WOW. Since the ARI contest in May 2015, I made 140 QSO's with 3 types of cylinder dipoles. The table shows the 3 different cylinder dipoles that I used, in several contest in 2015 and 2016. I made this table to show the number of QSO's, that were made, with each of the three types of cylinder dipoles that I have build. I used the Red Bull antenna in the ARI contest on 20 m and 40 m. At that moment 15 m and 10 m showed no activity. But the propagation on 20 m and 40 m was excellent. The 6 QSO's on 10 m were made in two different 10 m contests. 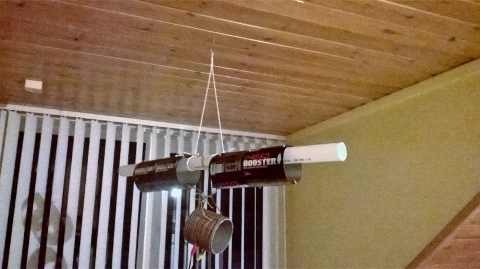 The Monster antenna, made of two Monster cans of 500 ml is an excellent, easy to build indoor antenna for 15 m, but also works on 20 m. The table show that it works better on 15 m that on 20 m.
The Booster with it's wingspan of 55 cm (22") is build for 20 m and 30 m and is until now, only used in the PACC. The used the cylinder dipoles indoor from the shack or from a dormer window at the second floor, with a power of 4 W or less. Booster - Cylinder dipole 22"
In the PACC I used a new cylinder dipole, that I have build recently. I built the Booster to experiment with larger cylinders and a larger coil. To go below 15 m.
of 4 Energy Booster cans of aluminium, that are cut open and bolted together. The length of each cylinder is 22 cm. The wing span of the dipole is 22 inches. The coil former has a diameter of 110 mm and the coil has 15 turns. 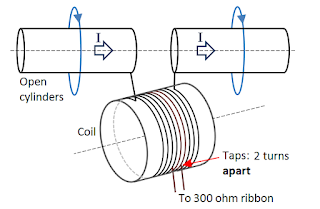 The taps are two turns apart. The Booster resonates at 10 MHz. On Friday I made the coil and just before the contest I made the taps on the coil. During the contest I used the taps that are two turns apart. The Booster could not be MATCHED with the taps 4 turns apart. I suspect that the impedance on the end of the twin lead in the shack is too low, or too high, for my symmetrical tuner. So I switched to the taps that are 2 turns apart. I later realized that I did not try taps that are one turn apart. I started with checking the MATCHING of the Booster on 15 m, 20 m and 40 m. Matching on 15 m and 40 m is very easy. Matching on 20 m is difficult. Before the PACC, I made the first QSO with the Booster on 40 m, with 7S6WRD from Sweden. My RST was 339. hi. Not a very strong signal, but it works. I made a total of 32 QSO's with the Booster. 25 QSO's were made on 40 m with 3 W and 2 QSO's with 150 mW. On 20 m I made 5 QSO's with 4 W.
I had no intention to make hundreds of QSO's, but I wanted to know, how the Booster would work. On 15 m and 20 m there was no activity, So I started on 7 MHz. The first 3 QSO's were made with 2 Dutch stations (PA) and with F5IN, all with S&P. Then I stopped to visit some friend. Around 17:00 utc, I started again on 40 m. I decided to give CQ. 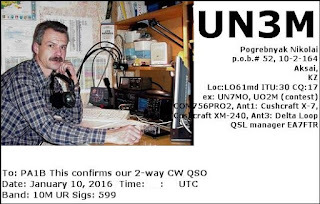 To my surprise, I was visited by stations from DL, HA, OE, OK (4), SM and UA (3). I was pleasantly surprise by the stations from Russia that answered my CQ, over a distance of more than 1300 miles. Sunday morning on 40 m gave a mix of stations from PA and DL. When the propagation peaked, I could QSO with PI4CC and with DL5JQ using just 150 mW. WOW. But in the next QSO's I needed a power of 3 watt. hi. At about 11 utc I went to 20 m and made 5 QSO's with 5 DXCC countries, all QSO's with 4 W.
During the contest I frequently went to 20 m and 15 m. Most activity was on 40 m, as you can see in the table. The Booster is doing fine on 40 m and 20 m. I worked 10 DXCC countries from the dormer window with the Booster at a height of 7 meters above the ground. Cutting the cans - Mooi schaartje hè. In the PACC I tested a new cylinder dipole - The Booster. I tested on 7 MHz and 14 MHz with 3 or 4 watts. 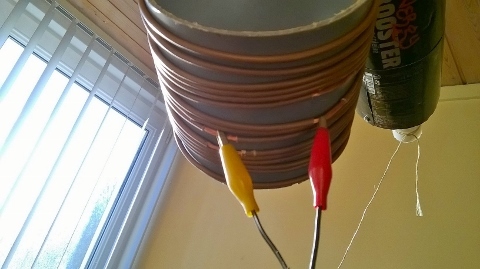 I use my cylinder dipoles as indoor antennas. I placed the Booster in the dormer window.(dakkapel). As a milliwatt enthusiast, I enjoyed to make 2 QSO's with QRPp, which is less than 1 W.
When the propagation peaked on Sunday morning, I heard PI4CC, with a very loud signal. S9++. I reduced to 150 mW, before answering their CQ and made the QSO. In the next QSO with Erhard DL5JQ, I also used 150 mW. His signal was also very strong, S9++. In the next QSO I first tried 150 mW, but I needed the full power of 3 watts to be heard. hi. 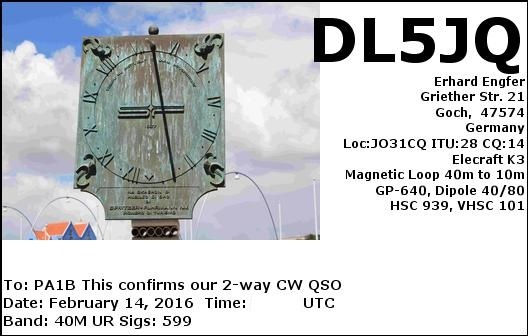 Yesterday I answered the eQSL of this very special QSO, with Erhard DL5JQ. After answering the eQSL, I have sent Erhard an email via eQSL to inform him of my power and my antenna. Fabelhaft!! Dein Signal war sehr stark. S9++. Ich habe in unserem QSO, einer Leistung von 150 mW verwendet. QRPp. Ich bin ein begeisterter Milliwatter. Wenn die S-Meter nach oben geht, geht meine Leistung nach unten. Aber schauen Sie sich auch, das Etikett Cylinder dipole an. Dank für das nette QSO. Ich hoffe du nächstes Mal zu treffen, mit niedriger Leistung. hi. OK dear Erhard, thanks for the nice QSO and eQSL. The Booster is a cylinder dipole. The two cylinders, are each made from 4 Energy Booster cans from aluminium, that are cut open and bolted together. I built the Booster to experiment with larger cylinders and a larger coil to work on 14 MHz and 7 MHz. 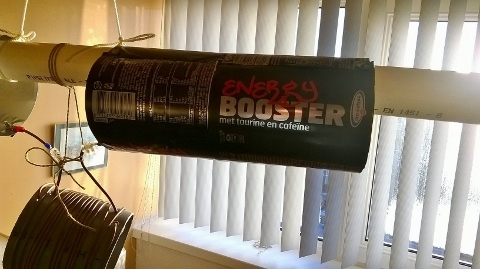 The Booster has twice the size of the Red Bull antenna. The length of each cylinders is 22 cm. The wing span of the dipole is 22 inches. The coil former has a diameter of 110 mm and the coil has 15 turns. The taps are two turns apart. 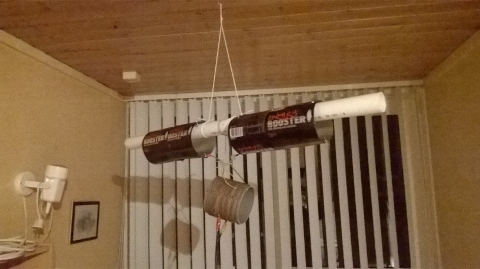 The Booster resonates just above 10 MHz. When I putted the Red Bull antenna into use in the ARI contest, I made 9 QSO's on 14 MHz and even 1 QSO on 7 MHz. At that moment I did not know that the conditions were extremely good. 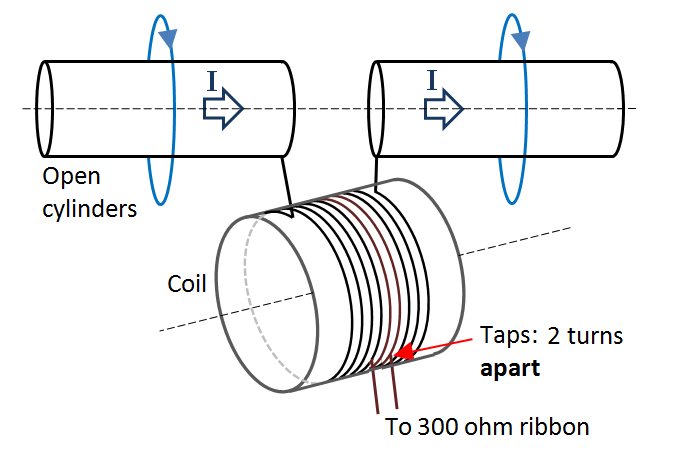 The Red Bull antenna with the coil of 14 turns on a tube of 40 mm, resonates on 26 MHz. So now I was curious, how the Red Bull antenna would do on 28 MHz. I decided to participate in the DARC 10 meter contest, to make QSO's with the Red Bull antenna. A contest for 10 meter is a good opportunity to make contacts on that band, because it creates activity. The DARC 10 meter contest is a very short contest, that runs from 9:00 till 10:59 utc. I have been on the band for 90 minutes. During the whole contest, I did not hear any German stations, because of the very short distance to Germany. After a few minutes I could make a QSO with LY2NK with 3 watts. Then the band was empty, but I had to stay on. Much later I could make a QSO with UN3M. Nickolay is in the western part of Kazakstan. The distance is about 1950 miles. FB.